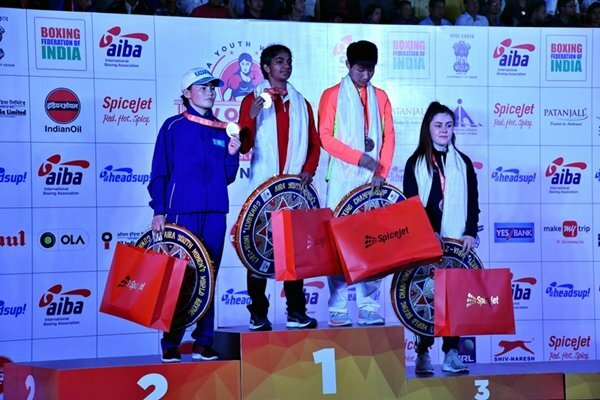 Sunday witnessed ten thrilling finals of the 2017 Women’s Youth World Championships in the north-east India city of Guwahati, at which Russia, Kazakhstan, USA and South Korea topped the podium along with the hosts India whose boxers dominated the lighter weight categories. A total of 160 boxers from 31 countries began the week-long tournament, which also made available four quota places for the 2018 Youth Olympic Games in Buenos Aires. The day’s first final saw Indian southpaw Nitu looking to stay in close to her opponent, Kazakhstan’s Zhazira Urakbayeva, but it wasn’t until the second round she could really let her hands go, successfully landing some accurate blows against her technically excellent opponent. Urakbayeva was able to work her way back into contention, but Nitu’s patience paid off, and as the Referee raised her hand, the crowd erupted in celebration of their first gold of the day. India’s Jyoti Singh had only recently moved up to Flyweight (51kg), but took the rest of the field in Guwahati by storm to earn gold and crown an impressive campaign. Having recently defeated Russian 17-year-old Ekaterina Molchanova in the final of the Golden Gloves of Vojvodina Women’s Youth Tournament three months ago, Singh looked relaxed meeting her once again, and it was her quick-fire combinations in the opening round that set her on course for victory. Those aggressive attacks continued as the bout wore on, and victory brought both gold and a place at the 2018 Youth Olympics in the Argentina capital. Sakshi Choudhary proved to be one of the outstanding performers in Guwahati, the Junior World Champion adding the Bantamweight Youth title to her CV in impressive fashion with victory over England’s Ivy-Jane Smith. The two boxers spent much of the first round probing for weaknesses in the other’s defences, Smith looking well organised and efficient with her jabs, but it was Choudhary who raised the tempo most effectively as the bout wore on, crowning an excellent tournament with a hard-earned gold medal. India’s Shashi Chopra made it an incredible four straight golds for India when she edged a tight contest against Vietnam’s lone competitor in Guwahati, Do Hong Ngoc. The Vietnamese boxer went into the final unbeaten this year and looked focused from the opening seconds, stifling Chopra’s attacking instincts early on. The 18-year-old Indian found her rhythm in the second round, however, her jabs finally clicking and finding their target with increasing regularity. Ngoc tried valiantly to outscore her opponent, but the split decision went to Chopra and India had their fourth gold medallist of the day. Italy’s EUBC Junior Champion Vittoria De Carlo had put together an excellent run to reach the Lightweight final in Guwahati, but South Korea’s Im Ae Ji proved to be a tricky target as her footwork repeatedly got her out of trouble. As De Carlo committed more energy to her attacks, Ji was able to counter effectively, and at the end of the three rounds, it was South Korea who were able to celebrate their first ever gold in the competition, De Carlo’s compensation coming in the form of a berth at the 2018 Youth Olympic Games. India’s Ankushita Boro grew up just 200km from Guwahati, and the Assam spirit flowed through her as she recorded a famous world title win. Russia’s Ekaterina Dynnik struggled to assert herself on the tie despite some early pressure, and by the start of the final round, Boro looked relaxed and in control. The 18-year-old Indian used her height advantage and kept her distance, picking off Dynnik as she advanced to secure an emotional gold and send the crowd into raptures. United States’ Citlalli Ortiz looked to have her tactics straight against Russia’s tall Natalia Sychugova, closing her down and not allowing her to express herself from the first seconds of their Welterweight final. The US boxer, who took up the sport in 2008 at the age of just 8, used all that experience to establish her superiority, and her impressive stamina as the contest drew to a close helped ensure a well-deserved gold for the American. Russia’s Anastasia Shamonova went into the Middleweight final against England’s Georgia O’Connor as Junior World and Youth EUBC Champion, and exuded confidence against the tough and talented English boxer. With just one defeat in her career, there were notably few openings in the Russia defences for O’Connor to exploit, and the latest win for the ever-impressive Shamonova saw gold and a place at the 2018 Youth Olympic Games assured. Russia’s EUBC Youth Champion Anastasia Rybak was faster out of the blocks than Araylym Begdilda at the start of their Light Heavyweight final, the Russian apparently realising that her best chance would come with an early finish against her talented opponent. Begdilda’s neat footwork kept her largely out of trouble, however, with a big right at the end of the first round shaking Rybak and, despite a late rally from her opponent, it was Begdilda who edged the split decision to earn the gold. The Russian team was able to turn the tide at Heavyweight, however, with Junior World Champion Kristina Tkacheva over-powering Kazakhstan’s Dina Islambekova to record a stylish victory. Tkacheva delivered an inspired middle three-minute period to take the contest away from her opponent, and had enough left in the tank to keep the Kazakh at bay as the bout drew to a close and earn the Russians their second gold in Guwahati. Previous boxing news: “Krusher” is back; Kovalev destroys Shabranskyy – Beterbiev, Bivol, Stevenson next?